(Guitar Method). Play great rock while you learn from one of the most revered guitar methods of all time! These songs map directly to the lessons of William Leavitt's Modern Method for Guitar Vol. 1 , the basic guitar text at Berklee College of Music. 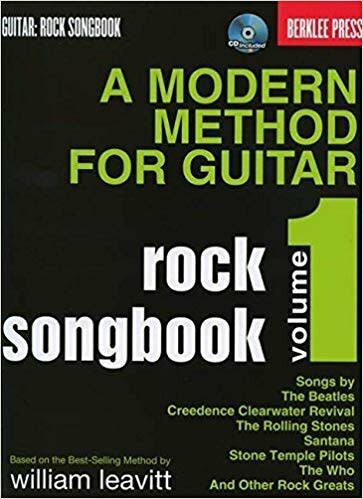 Carefully overseen by Scotty Johnson of Berklee's Guitar Department, these arrangements are crafted to Leavitt's time-proven approach, giving you the chance to apply what you learn to the music of the Beatles, the Rolling Stones, the Who, Creedence Clearwater Revival, Santana and many others. The accompanying CD demonstrates all tunes and offers play-along tracks for practicing the duets. Songs include: Beast of Burden * Day Tripper * La Bamba * My Girl * Oye Como Va * Pinball Wizard * Smooth * Sunshine of Your Love * and more.